I have just started with something on my side yard. I have a bigger space for gardening but I don't want to make use of the land because I have some upcoming projects for the said land, so I've decided to resort to container gardening for my home grown vegetables. This could give me me a flexibility to move the plants and secure them during heavy rains. Currently, I made use of my side yard for my vegetable garden planted in pots of different sizes. I wish to add up more and I'm still in the process of acquiring more seedlings. I think my vegetable garden will be in full bloom come summer. I can't wait to post real pictures here. 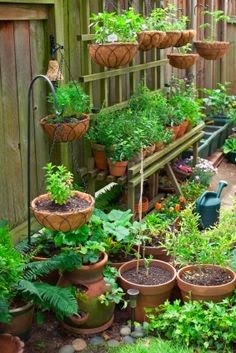 Container gardening is a good solution for those who do not have a big yard. In fact, this could be done even on the small patios. I've seen few designs on some interesting sites and this is where I adapt the idea of what I've started at home.